In-car navigation is still not something that every car on the road features - it’s not even something that is available on every new car - but the technology is growing by leaps and bounds. GPS and DVD style systems have been available for years and some even include real time traffic updates, but Pioneer is taking another step into the future with their augmented reality systems. These systems use a camera to project the image of what is in front of the car onto a screen in the cabin. Things around the car such as other vehicles, stores, traffic lights, etc are then superimposed with other images for identification. The new Pioneer AVIC-VH09CS double din unit can be useful in a navigation system for several reasons, mainly making your destination easily identifiable. Audi has recently introduced navigation systems with Google Earth maps that show real satellite images of the destination. Since the new Audi A8 has more electronics than the space shuttle, it includes a 3G high speed cellular connection allowing data to be downloaded. This WiFi hotspot is also able to support your cell phone, computer, or ipad for internet use. 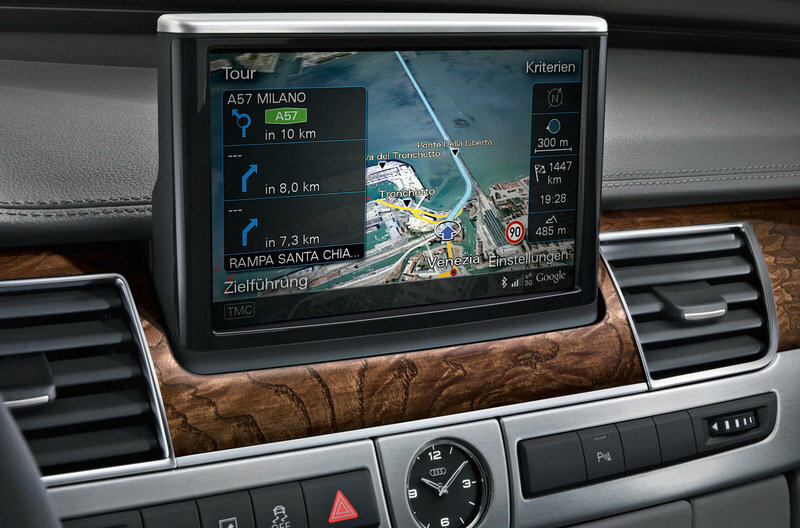 The MMI navigation system uses Google Maps destinations in order to search and navigate to a specific location. The system is further enhanced by allowing the driver to select Wikipedia articles and panoramic images of certain points just as if you were searching Google on your computer. This can be helpful when searching for a hidden location in an unknown area. Hit the jump to see what Pioneer has done to rectify this situation. The major issue with the new Google Maps interface in the Audi A8 is that Google Street View is unavailable. The driver is able to view topographical maps with certain destinations overlaid on top just like the Satellite view, but the system is unable to handle larger files. Google Street View would take a much larger storage space than the current 60GB internal hard drive of the system allows. Furthermore, downloading the complex Street View images on a 3G connection could take too long to be useful for someone driving down the street. The solution to this problem is the new AVIC-VH09CS double din unit from Pioneer. It uses a more standard GPS enabled setup for finding locations and getting directions, lowering the chances of internet crashes, and slow download times from interfering with travel. 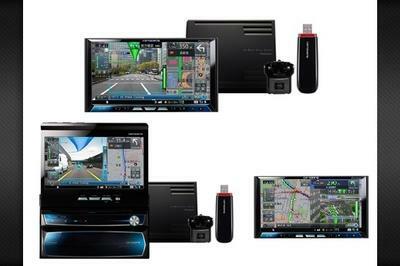 The system then uses a windshield mounted camera to stream live footage of the surroundings onto the video screen. With that image coming to the system in real time, it is then able to overlay driving instructions and visual aids over the image. The main advantage with this type of system is that it can be more accurate than ever before. Distances to turns and in between two points can be accurately identified and shown to the driver in a dynamic way. This system is also able to identify the various lanes on the road and show the driver clearly which lane he should be driving in to make the correct turn. This system is the first of its kind and many more improvements will undoubtedly be made before it debuts on the United States market. For now it is only available in Japan for roughly $3,700. This system is certainly the future of navigation and the eventual combination of Google Street View knowledge with real time video would be a great improvement to show the driver the names of stores and shops augmented onto the screen while they are driving. We look forward to seeing this system and others like it in person. This kind of technology should be consider, on the other hand, should not consider. Consider this because if a police man chasing a thief, this can help. On the other hand, this can also be used by the thief to know if there are police cars chasing him on the road, so he can think an idea on where to go to escape. Well, I don’t think that it will be required for all the vehicle for I’m afraid that private individual would feel harass on this gadget. hmm. It seems that the privacy of the owner and the driver are at stake. I don’t think that everyone would agree on this technology. How I wish that this one is actually installed in my car now. But it would provably cost a large portion of my car money just to get this. Oh well, maybe they would be releasing a smaller version soon. Woohoo, this is something that James Bond would really love. And I would also definitely would want to have this in my car, since it is very useful. Well, they probably are just using the Audi as a test bed, since it already has all the electronics to support the navigator. But they will probably make this one available for other car models soon enough. Hey wait, so this one is available only in the Audi? That’s too bad, since it really has a lot of uses for the drivers. Hope they would offer this one in other car makes. Yeah, this one is quite nice, especially if you need to get directions quickly. Good thing that they have been able to work on the Google Street View problem. Just like on the BMW future’s mobility, it was once said there that the reason why he drives is to escape from stress in the city but because of the high technology, its just easy to identify his location which is kind of sad. I have heard about this high technology long ago.. And the intention is great..However, I just don’t like the fact that it was traceable. Wow, an HUD system for the car, now that’s certainly something quite high tech. It’s just too bad that this system will likely cost a fortune and not many can afford it.